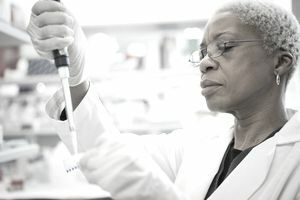 A lab technician collects and processes specimens, including skin and bodily fluid samples, from patients in a hospital or private medical diagnostic laboratory. He or she works under a laboratory technologist's supervision using procedures that help medical professionals diagnose diseases and, subsequently, plan treatments and ascertain their effectiveness. An alternative title for this career is medical laboratory technician. Employers include hospitals, medical and diagnostic laboratories and physicians' offices. Most jobs are full time and, depending on when facilities are open, may include weekends, evenings and holidays. Lab technicians come into contact with infectious specimens and toxic chemicals; they must take the proper precautions, including wearing protective clothing and eyewear, to decrease their risk of exposure to these dangerous substances. They spend a lot of time on their feet. To work in this occupation, you can complete an associate degree program in clinical laboratory science at a community college. This will take approximately two years. Alternatively, you can earn a one-year certificate from a hospital or a vocational or technical school. The Armed Forces also offer training for lab technicians. Some states may require a professional license. You can use the Licensed Occupations Tool from CareerOneStop to learn about the requirements in the state in which you plan to work. Physical Strength and Stamina: You must be able to lift and turn patients who have disabilities that limit their movement. Listening Skills: The ability to understand laboratory technologists' instructions and patients' concerns is essential. Reading Comprehension: Lab technicians must be able to read and understand instructions. Critical Thinking: You must be able to compare the benefits of different solutions to problems before choosing the best one.